The Wangan Expressway is built almost entirely of steel bridges and it includes many basket-handle arches. I can identify the Shin-Hamadera from the other basket-handle arch bridges because of its distinctive trapezoidal piers. It's located a few kilometers south of the Nanko Ferry Terminal and near Hamadera Park (and several emperors' tombs). In this photo, you can see the tension tie securely attached to the ends of the arch rib and supported on a bearing above each pier. 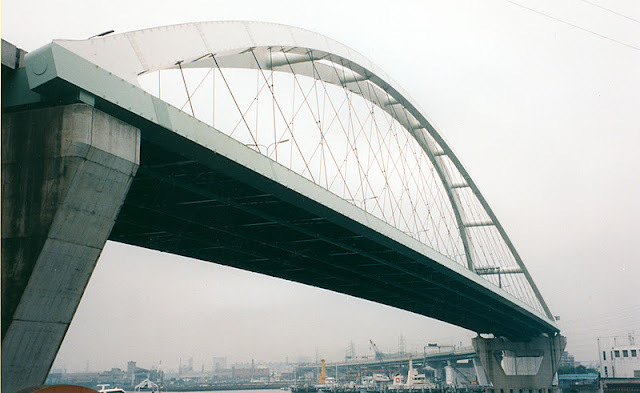 The tubular cross-bracing between the arch ribs and the diagonal hanger cables can also be clearly seen. The hangers on the arches are spaced at 70% of the in-plane buckling length and the cross-bracing is spaced at 70% of the out-of plane buckling length of the arch ribs. The superstructure was carried on pontoons to the site and lifted into place using the rising tide. The piers are supported by cast-in-place concrete piles. The span length is 254 m and the width is 20.3 m. The bridge was built for the Hanshin Expressway Public Corporation (HEPC) in 1991 at a cost of 4.6 billion yen. The HEPC must have placed an arch or cable-stayed bridge on the expressway wherever they needed a large opening for ship traffic. Unlike the western part of the Wangan Expressway, there was no damage to bridges on the eastern part due to the 1995 Kobe Earthquake. The easternmost bridge where I saw damage was the Nishinomiya-Ko Bridge. Osaka Bay Bridges: Shin-Hamadera Bridge by Mark Yashinsky is licensed under a Creative Commons Attribution-NonCommercial-ShareAlike 3.0 United States License.